An interesting post in BMJ Career Focus (click here). Why am I highlighting this – because networking will form part of Gwagle….. The Clinical Cases and Images blog has highlighted the rather nice schmedley site. Interesting pattern shown over December. Below is a chart of our weekly search stats. 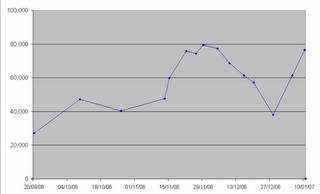 At the start of the graph we’d been free for 3 weeks and were receiving around 25,000 searches per week. This rose and peaked at the end of December (at 80,000 searches per week), then started to drop, the low point being 27,000 searches around Christmas day. Since then the searches have picked up and are as good as at our peak number of searches. People distracted in December – surely not! Reported here: A Harris Interactive poll conducted for Yahoo Local found that 67 percent of respondents said they would be likely to post an online rating or review, and 79 percent of respondents said they’d be likely to be influenced by such a rating or review. This highlights the rise – is it an expectation – of web 2.0. Gwagle, hopes to use this willingness to share experience when it launches. A collection of educational medical videos for students and doctors click here. Based on PubMed Central (PMC), the U.S. National Institutes of Health (NIH) free digital archive of biomedical and life sciences journal literature, UK PubMed Central (UKPMC) provides a stable, permanent, and free-to-access online digital archive of full-text, peer-reviewed research publications. Jello Biafra talks about net neutrality on YouTube! For more information on net neutrality see this wikipedia article.